Visit Rod Laver Arena, home of the Australian Open Tennis and many concerts and events, Flemington racecourse, home of the Melbourne Cup – the race that stops the nation. Drive through the Commonwealth Games 2006 Village and around Albert Park, on the Melbourne F1 Grand Prix Circuit alongside Melbourne Sports & Aquatic Centre. Tours depart Monday to Friday at 8.30am from Federation Square (At Melbourne Day Tour Centre) and return at 1.30pm. Some venues may not be available on requested day due to events. 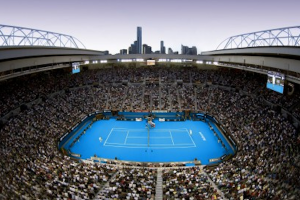 Rod Laver Arena option not available from Mid December – Mid February due to The Australian Open Tennis Championships.